I will try to keep this as short and concise as possible. I am a 3rd year PhD student in theoretical physics (condensed matter theory) in a US university. I worked for a certain professor for a year and things seemed to be going well, until he announced one day that he could not continue working with me because his grant application fell through. So I was forced to look for another advisor after I had already started my third year. Nobody else in the condensed matter group wanted to take me because they all claimed not to have funding (this turned out to be a lie, as I later found out). I was finally forced to work for a professor who is 76 years old and does not do research anymore. He has an incomplete project he hasn't worked on for 20 years and I am trying to complete it. I do NOT mind working on an old project. The problem is that whenever I ask him a question or ask for feedback, he ignores me. He does not have any ideas and when I ask for feedback and suggestions on my own ideas and work, he says he doesn't know and I can do whatever I want. I have tried approaching other professors in the department for help, but they refuse to meet/talk to me, saying that they are busy. I am worried that I will never be able to come up with a decent thesis without any sort of guidance, and will almost certainly not have any publications. My question is: Is there any way I can minimize the damage to my career that this is causing? Is it possible to get a post-doc in theoretical physics without a publication/ with a sub-standard thesis? I am an international student and there are no physics jobs in my country, so any kind of advice on how to proceed would be welcome. If anyone wants more detailed information, I am happy to provide it. I think you should consider transferring to another grad school. Certainly prospects on the post-doc market won't be good without any publications, interesting work, or a strong letter of recommendation. On the other hand, your advisor's grant expiring and no one else being able to take you gives you a very good reason to want to change grad schools. Your former advisor's letter will be crucial. If he confirms your story about the grant falling through and no one else being able to take you, you should be able to transfer no problem. If he hints that your conduct contributed to your situation, you could be in a pickle. Good luck! 20 years is not so much. If that project was useful 20 years ago, you should understand it. Based on what you said, we have no way to know, what is in the background. A possible explanation: the professor is practically retired, is not hungry for more publications, and was nice enough to take on a student who needed help. The important thing is: you don't need this knowledge for your optimal strategy. "he says he doesn't know and I can do whatever I want" <-- You have free hands. Check that 20 years old work, and check what relevance it has today. And then, follow what the old prof said: "do whatever you want". You may have got a "window seat"1, but you've also got the possibility to get your PhD and work freely. The prof is probably a honored member of that department, his protegee won't be simply fired on some cloudy reason. You surely hadn't got this option if they would want to expel you. Also the workplace world is full with such situations. Typically, you know what are the decisions about your position, but you have only a few fragments, why. The important thing is, if they would think you need these infos, they had said it for you. There are no safe positions, if you get a gift, there is no reason to reject it. 1 Slang in the Japanese government for out-of-favor people not being fired, but not getting real work tasks any more. There is one aspect missed by other answers and commenters: you were admitted to PhD program to succeed and there are people who are interested in that happening. Namely, you should set up a meeting with your departmental graduate advisor. That is a person who's job is to help students and guide them through grad school policies and possible help fix arising issues. Your next point of contact will probably be department chair. It is their job to make sure that students are busy and professors are doing their job. Just remember that you have made significant investment in your current position, and school has made same thing. Have you spoken to your department, which has a responsibility to make sure the necessary elements are in place in order for you to complete your degree? If your department wants to leave you high and dry, then I suggest you consider: Your current advisor, who has one foot in the grave, seems willing to fund you without caring how much meaningful work you do on his project. Alternatively, perhaps you could support yourself in the most common way -- as a teaching assistant. They all claimed not to have funding (this turned out to be a lie, as I later found out). What possible explanations of this have you been able to work out? What objective corroboration, if any, exists for some or all of the possible explanations? Is what you described part of a larger pattern, or was it an isolated negative incident? I have tried approaching other professors in the department for help, but they refuse to meet/talk to me, saying that they are busy. What do you think about this? Do you suspect the "busy" excuse is a lame attempt on their part to distance themselves from you? If so, what do you think is the underlying reason for this? Has this avoidance pattern always been the case? If not, why the change? Since the best answer tells you to cut your losses and move, I'll expand a bit on the second best answer which raises a valid point. You have independence, possibly for the rest of your PhD. The question is if it helps you, or kills you. The killing part is likely if you are isolated and can't get any help in any way whatsoever. Many postdocs fail to make progress once they leave their PhD adviser and have to come up with their own ideas. Sometimes even new professors fail. The reason is that there are many things involved in doing independent research. You have to learn how to search for new ideas, and you have to learn when to stop searching and start calculating. Plus, once the stuff it's calculated you have to learn how to write reasonably well to get it published. And everything while worrying if you got that technique right or not. Doing research alone is a lot like flying a plane while having to replace some faulty engine parts guided by some old technical drawings and an incomplete flying manual. So, if you want to survive in the department, you need allies. Your adviser might not help you with technical advise, but may help you connect with other senior researchers (preferably active) with whom you can discuss. He might also help you get into summer schools, especially if you need to apply for funding to participate. In fact, if your relationship with the previous adviser is ok, he might help you with the same things. Other possible "allies": your PhD committee, if you have one, students and postdocs at your institution you are friendly with. Once you can think of a possible research subject, you can discuss with them, if the faculty are "busy". Even if they can't help you directly, they might be able to suggest techniques, papers, etc. that may help. Conferences and summer schools are important. If you can't participate, your isolation will just increase. If you can, try to meet people working on problems connected to yours. Also, you need to become more organized. If you have a participating adviser, you can afford to waste six months on some detail. At the end he would tell you that it was a waste of time and you should do something else. But, if you're alone, you need to either figure that out for yourself or have friends/collaborators pointing out the issue. But, if you can't make collaborations, have no one to talk to about research and can't attend conferences and summer schools, leave as soon as you can. It won't get better, unless you're smart like that dude who was working at a patent office in Switzerland. Even that guy had a friend tutoring him in tensor algebra. The other answers had good advice, imo. I'm about to suggest a few things. Please forgive me if you've tried all of this. However, please give it some thought to make sure you're not missing something. Very few people ignore me in person. So I'll assume you're not asking him in person. Make sure you're asking in person! I immediately switch to phone or in person if electronic communication isn't going as intended. Next, make sure your attitude toward him is correct (It might be but I thought it was worth mentioning). If you're upset or angry with him, that will likely come through when you interact with him. Sure, he isn't doing his job properly. And it could severely harm your career and future. You have a serious problem here and it's perfectly valid to feel angry and upset. However if you feel that way, it won't help your situation. What will help your situation the most is to be the bigger person. Chances are he's partially to completely oblivious to what he's doing and how he's making you feel. Give him the benefit of the doubt to overcome your emotion (that could be you one day!). Make sure you are taking his interests into account. Do you know what he wants? One thing to do, too, would be to ask him what his goals/aspirations are. Also ask him how you can help him achieve those (and do it). If your attitude is to support him without false pretense, that will shine through. He is much more likely to reciprocate. I'm really worried about my future here. I need more advice and criticism to make it. It's my dream to pursue research in physics. I can't and won't give up. However I'm stuck. I don't know what to do to move forward. How can I get the advice and criticism I need? What do I need to change? I'd actually recommend recommend pursuing all options at once (although I'd recommend approach him before others at the university - I think it's better to make every effort handle things with the person before escalating). So do this while also preparing to possibly transfer, etc. You've made it this far. There is a path to move forward. You just have to find it. In fact, you've already started down the right now by coming here for help. Don't give up! If you can slip into the right frame of mind, your situation is really fortuitous. In order to make the case you're qualified for a faculty position, you need to show a high level of independence. Yes you're being forced into this situation by your current advising arrangement, but you'd probably be anyway if any school were to hire you as a faculty member. Why not develop your own research program that you can potentially take with you? Independence doesn't mean working on things all by yourself. What it means is soliciting the right collaborations, both within and outside the standard support system offered by your university and grants. Since you have a sponsor, assuming you have a good relationship with your old advisor you could probably go back to your old advisor's project. Or you could find the other people in your new advisor's field and work on his project. Your call about which could lead to more important work and which makes the most sense given your situation - or, as another answer suggested, you could do a bit of both. But all else being equal, you're probably better off establishing yourself in a single field. There is a third option. Really take advantage of your freedom. Find the collaboration you would most want to be part of, and figure out how to contribute. If you think you could contribute you have no reason not to choose a top university, a Nobel laureate, or the project of your dreams. In the Internet era, with more types of long-distance communication possible, it's become easier to do this. You can enter a collaboration slowly - start by reading and corresponding and if you like what you're getting back, gradually put in more. This might be the riskiest path and might mean you need to be a visiting student somewhere or switch advisors/departments/schools again, but it always "looks good" to have a respected name or group among your collaborators. P.S. You might be too demoralized or worried to do any of the above properly. If you are, take a leave of absence. You might also want to read about my namesake La-comadreja, the weasel. The weasel is small and cute and so good at slipping through small openings in space and time, it doesn't fit into anyone's idea of what a small animal should and shouldn't be capable of doing. 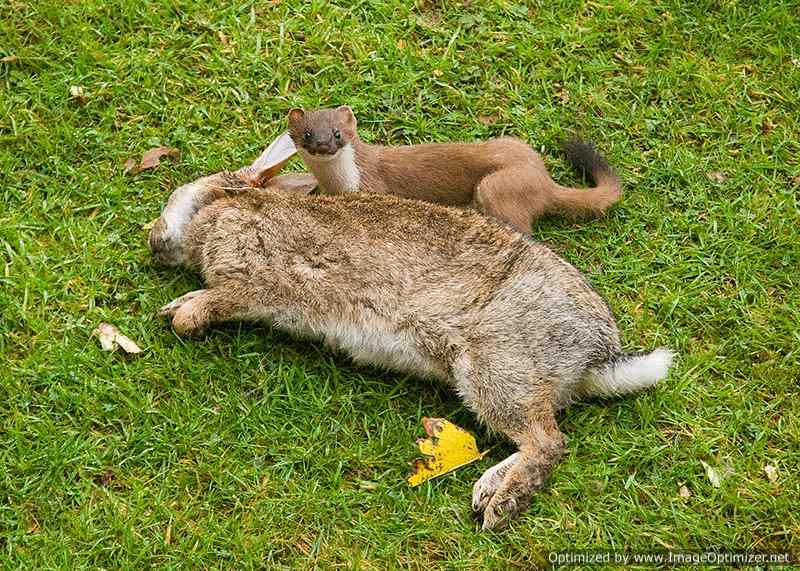 Here is one of the things a weasel can accomplish. It's lightning fast and took advantage of a tiny, ephemeral vulnerability in rabbit defense. Another one of the weasel family's achievements is weaseling their way to a life in the sea (sea otters are in the weasel family). Sorry about your unpleasant situation. I generally agree that moving to another place is (probably) the best idea from the information you have given, but try to make sure that whatever issues you had in your old place don't recur. For example, check your department and possible advisers out throughly. Make sure funding is available. Though are teaching assistantships not available at your university? From everything I know, if your PhD is of poor quality, you are basically screwed. It's brutal out there. So you need to do everything you can to ensure that your PhD is of good quality. At the end of the day, the quality of your results will affect you more than anyone else, by a long way. In theory it can reflect poorly on your adviser if his students do badly, but in practice nobody cares, unless your adviser is up for tenure or something. At the risk of stating the obvious, some departments can be in very poor shape, but it's not so obvious from the outside. So, do your homework/due diligence. Talking to current and past graduate students can be helpful. For relevant faculty, check their past students and where they are now. And also, of course, check their publications. Obviously, you will also need to visit the campus and meet with faculty and students, but that isn't sufficient by itself. Another thing to check is whether you will be able to transfer any credit from your current university, or whether you will have to start from scratch. Other people have suggested in their answers that the situation may be salvageable at your current university. Of course, this is hard to say, but from your description, it does not sound promising. Also, did you check out your current department properly before joining it? I understand your situation and sympathize greatly. I'm in an unfunded lab and it's difficult finding TAships to fund yourself. Other people who are saying that there is something wrong with you, probably don't know the whole situation. I also completely understand what you say:Nobody else in the condensed matter group wanted to take me because they all claimed not to have funding. This is because no one wants additional work. Why would a professor add another student even if they have funding. They are busy with their own problems and their own students already. It might not be you specifically. Everyone who has commented that it is all your fault or something wrong with you, highlight serious issues with academia. Things happen, funding runs out, professors get lazy and maybe don't want to take on an additional case. That doesn't mean it is the student's fault completely. In addition, the professors in the graduate group/department probably don't think their own funding, department's ranking, and the graduate group's ranking will change much if one student doesn't make it to the end of the PhD. You are considered collateral damage that's why they don't step in. I think you should consider a masters and get out as soon as you can. Then apply for a PhD at another university. Not the answer you're looking for? Browse other questions tagged phd advisor early-career or ask your own question. What do potential postdoc advisers seek in research statement letters? How binding is a PhD application for theoretical vs. experimental physics? Is master in physics at Germany well respected in US?